All Lexmark printers are supplied with an installation CD comprising the driver and software specific for the printer. In most cases, the driver on the installation CD may be outdated or incompatible with your computer’s operating system. An outdated driver may not function properly and gives a troublesome printing experience. To avoid such a situation, you need to know how to download Lexmark printer software without cd from the manufacturer’s site. The latest driver and software packages for your printer are available for free on the manufacturer’s support site. Step-by-step procedure for downloading the driver for your printer model is given in the following section. Go to the manufacturer’s site and then select your country and region. Provide the printer model and then select the Downloads tab. Choose your operating system and its version. Open the driver page and then select the software or driver. Click the Download tab and wait until the file downloads. Proceed with the steps below for downloading the driver for Mac. Power on the printer and connect it to your computer using a USB cable. Select the Install option on the dialog box that opens on your computer. Check if the printer is added to the print queue. Check if the setup is successful by printing a test page. Step 1: If you are using Internet Explorer, you need to create a folder for saving the software. Return to your desktop and create a new folder. Name the file as Lexmark for easy identification. For Google Chrome or Mozzila Firefox browsers, the file will be saved to a predetermined location such as Downloads folder or Desktop, configured for them to start the process of how to download Lexmark printer software without cd. Step 2: Go to the manufacturer’s site and click the Change Region option. Select your country and language. Type the printer model in the Enter Product Name field and click the Go tab. Alternatively, select the type of your printer and click it. From the list of models in the printer type, choose your printer model. Step 3: Now, find the Downloads tab and then select the Operating system. Specify the version of your operating system. To view the full list of software and drivers for your printer, click the Complete List of Software option. Select a driver package and click the Download option. Step 4: If you have downloaded it using Internet Explorer, the File Download dialog box pops up. Select the Save option. When the Save as dialog box opens, select the folder that you have created and click Save. 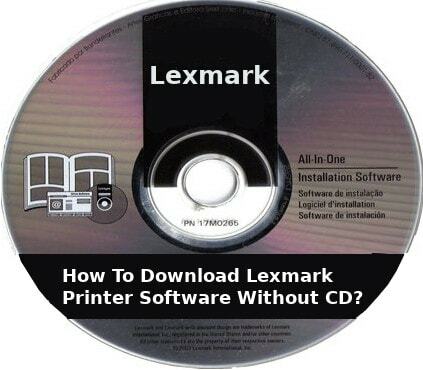 The process of how to download Lexmark printer software without cd starts. Step 5: If you are using the Mozilla Firefox or Google Chrome browser, the file automatically downloads. Find the downloaded file in the Downloads folder and proceed with the installation. Step 6: Find the dowloaded setup file and double-click it to begin the installation of the driver. If a security screen pops up, click the Run tab. On Mac, the Series Installer dialog box opens. Give a double-click on the Install tab to start the installation. Step 7: Alternately, you can run the Windows Update to install the driver. First, power on your Lexmark printer and connect it the computer using s USB cable so that the Windows can detect the printer while installing the driver. Step 8: Click the Start menu on your Windows OS. Go to the Hardware and Sound option under Control Panel. Choose the Device and Printers option. Select the Add a Printer option and wait while the Windows searches for the available printers. Step 9: If the printer is not displayed, select The Printer that I want isn’t listed. Click Add a local printer and then choose Next. Click the Use an existing port option since the USB is already plugged into the USB port on your computer. Click the Next option and wait while the port is being identified. Step 10: Now click the Windows Update option. You should see the message “Windows is updating the list of printers. This might take a few minutes”. Once the update is complete, find the Lexmark printer from the Manufacturer’s list. Step 11: Click the Printers option and then select the Printer Driver option. Click the Next option. Choose the Set as the Default printer option and then print a test page to verify the setup. Click Finish to end the installation process and end up the how to download Lexmark printer software without cd process.